Since water saturation is the natural result of the previous calculations, it is often reported by the log analyst as one of "the answers". However, it is the amount of oil or gas, not water, that is wanted. This information flows from the following equations. These saturations are needed in order to find hydrocarbon volume which could be produced from the well. CAUTION: There are many situations where Smo cannot be calculated, and many silly results have been presented to clients over the years. If invasion is very shallow, Smo may be zero when in fact the zone is an excellent producer. Likewise, deep invasion gives useless results. If your computer program insists on calculating Smo, you will have to fiddle with RMF to get rational results, or set RMF > 10 to make Sxo = 1.0 always. For reserves calculations, it is sometimes convenient to convert saturations to volume of fluid per unit volume of rock. These volumes are often called bulk volume and the "per unit rock volume" is unstated. These volumes are also needed when using computers for plotting log analysis results versus depth. This data is used to calculate hydrocarbons in place and recoverable reserves. If the rock volume is broken into two or more constituents then these additional curves should be plotted and shaded appropriately. This example shows a comparison of residual oil from core in a depleted zone (M1 interval) and in a bypassed zone (M3 interval). The Sor from core equals (1 - SW) from log analysis, so there is no moveable oil in the M1. The close match suggests that most of the saturation parameters (A, M, N, RW@FT) and porosity are reasonably well calibrated. Since the world abounds with depleted zones (most are well known to the well operators) this test should always be made to confirm SW parameters where ever core data is available. M3 interval. 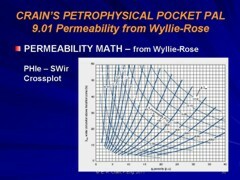 Calibration to core permeability needs more work to get a decent match.